Those who know me always joke about how I rant ‘on and on’ about KNOWING YOUR NUMBERS! ‘What’s your breakeven?’ ‘What’s your average dollar sale this month?’‘ Are you on track to hit your target profit margin?’ But the sad truth is, asking these questions to trade business owners we speak with often results in blank stares. The thing is, it’s not their fault. Far too many trade business owners have never been taught the importance of watching their numbers. They’ve never been taught ‘what’ to look at, or ‘when’ to ensure they're on track and hence in control. It leaves them feeling lost. It means they are making decisions on gut feel. Not backed with fact. Their bookkeepers and accountants have even tried to get them to take notice, but the tradesperson is simply too interested in getting back out on the tools. Doing what they know best. A good friend of mine, who is an accountant, was even telling me recently how frustrating it is working with trade business owners. “Why?” I queried. “They hand me a shoebox of receipts once a month, expect me to make sense of it, never provide the information I ask for throughout the year, they simply aren’t interested. All they want me to do is keep their books up to date so they can close a financial year. Even then they simply sign the ATO paperwork, which might I add, makes them liable for the work I have completed with little, if any, input from them. Let me make one thing clear; your accountant should be your best friend. They need to be your trusted advisor and should be kept close to help you understand the numbers in your business. It’s not ‘your thing’, but it is theirs. Our members will often hear me say ‘there isn’t one decision I make that is over $10K that I don’t consult my accountant first’. You should do the same. One thing is for sure; MONEY matters are of top priority. And hence, understanding ‘what’ and ‘when’ you need to review your numbers is an important part of any successful business. You need to understand your ‘PAST’, ‘PRESENT’ and ‘FUTURE’ when it comes to money but let me explain what I mean…. Let’s use a metaphorical car trip driving from point ‘A’ to point ‘B’. Your PAST, is the condition of the car. The mileage, maintenance history, petrol consumption, and more. It provides the history of the vehicle and hence the data to support the prediction of how your trip will go. Your PRESENT, is what is happening right now on the trip between points ‘A’ and ‘B’. Today. The water levels, speed you are driving, petrol remaining and more. Your FUTURE, is the actual decision to drive from destination A to B. You will need to consider different elements such as the time it will take, cost of the petrol, condition of the car and stops along the way – to ensure you reach your final destination. Without reviewing these different stages in isolation, there is little hope of arriving at destination ‘B’. The reality is, there would not have been a ‘B’ to start with. It’s like driving blind. That being said, it puzzles me as to how business owners think they can get from ‘A’ (business start-up) to ‘B’ (business success), without the same consideration. Let’s take a look at this within your business. When it comes to the ‘PAST, PRESENT, and FUTURE’… what should you be looking at with your accountant? To explain this we developed ‘The Financial Focuser’ below. 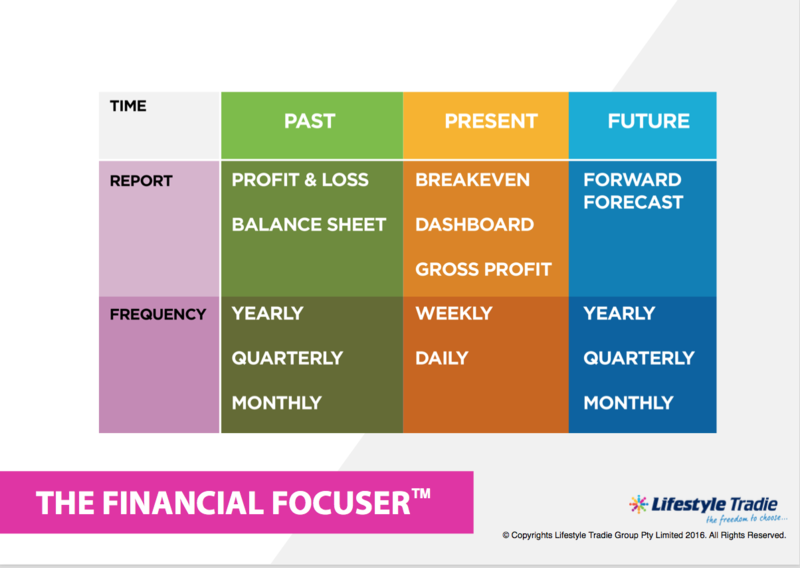 You can see in ‘The Financial Focuser’ that you should be looking at your past & future reports on a yearly, quarterly, and monthly basis. In terms of the present you should be looking at specific financial reports on a weekly or daily basis. This is where understanding each of these reports in isolation is really important to you and the success of your business. It is a good idea to lean on your accountant to understand what the reports mean and how to read them, then take control of doing this based on the frequency we recommend. Only by looking at these financials regularly, will you be able to understand your trade business inside and out. You simply can’t ignore this any more! This is one area that our members of Lifestyle Tradie claim they have literally taken back ownership of their business. They now feel more in control and can make decisions based on fact. As a trade business owner myself, I understand the additional cost when meeting with your accountant, but I can honestly say the knowledge you will gain from it is worth its’ weight in gold! So what are you waiting for? It’s time to stop driving blind. Book in a meeting with your accountant to discuss your PAST, PRESENT, & FUTURE before it’s too late. Trust me when I say you won’t regret it… and if you said to yourself ‘where do I start?’ ‘what questions do I ask?’, then let us help you. Check out ‘The Accountant Advantage’. This free download includes a Checklist and Questions to ensure you’ve got the RIGHT accountant in your corner. Click here to download. Founders Lifestyle Tradie Group Pty Ltd.
Passionate about helping trade business owners achieve business and lifestyle success, Lifestyle Tradie founders Angela and Andy Smith have spent the last 9 years mentoring trade business owners Australia-wide. They themselves are the owners and operators of a highly-successful plumbing business in Sydney!